Comfrey: Comfrey salves, ointments and teas are best known for the topical treatment of burns and just about any skin irritation. Goldenseal: Goldenseal is a folk medicine staple widely used in many herbal salves and ointments as a contact disinfectant. Plantain: The macerated fresh plantain leaves are put on bee stings and used for skin irritations, malignant ulcers,and burns, and to stop bleeding in minor cuts. I have only listed three basic plants here that are quite common and each can be utilized to help clean and treat minor cuts, burns and scratches. For your homework research 2 additional plants native to your area that you can use to help treat minor wounds or burns. This entry was posted in Uncategorized on April 30, 2013 by admin. In ancient times, the ninja had to understand and be able to treat common injuries from training and or from warfare, as well as be able to treat themselves or others for diseases. Today, we have the luxury of driving to the doctor’s or calling 911 for an emergency, but what if you couldn’t call or get to where medical treatment could be applied? As one of the 13 skills I chose to improve upon this year, Emergency medical treatment was one of them. Over the years I have been involved as a first responder for hazardous emergencies through the various jobs that I have held, but much earlier in my life I began gaining a basic understanding of traditional methods for healing soft tissue injuries, acupressure, and medicinal herbs. More recently I have continued on by attending various first aid, and tactical medical courses. I also have several first aid kits that I carry on backpacking trips, in my vehicle, work, dojo etc. All with the underlying belief that it is better to be prepared than not to be when the time comes. Has this paid off? Yes, I have assisted at car accidents, seizures, lacerations, broken bones and CPR events. These three points will help lead you down a path of Ninja preparedness that could save you or your loved ones life someday. Not to mention that basic healing techniques after training go a long way in a speedy recovery! Alright now go out and train! PS: A new revamping of our Online training sections is underway and more information on Ninja Medical remedies will be available soon! This entry was posted in Uncategorized on April 21, 2013 by admin. Stories of my untimely death at the hands of a rogue Ninja clan are sadly untrue! Actually, I took some time off for family and training reasons but now I am back with a lot of new material coming your way! I receive a lot of emails from practitioners around the world and the following is a great topic for us all to think about. This entry was posted in Uncategorized on April 18, 2013 by admin. One thing that drew me to ninjutsu was the variety of hand held and often deceptive looking items that were actually deadly weapons. 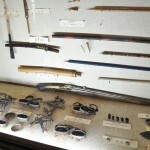 Weapons such as: Shuko/Ashiko, Tetsubishi/Makibushi, Kakute, Tegiribo, Kakushibo, Konpi/Konpei, Shuriken, Fukiya, Nekode, have fascinated me since I was a young boy. But, how do we utilize these ancient weapons in today’s modern world? Well of course we interpret and adapt! By this I mean utilizing the principles of concealed weapons in a modern “legal” manner. Here is an example for you, metsubishi (sight remover) was a common tactic of the Togakure ryu ninja. They would hollow out an egg and then replace the contents with a combination of ash, nettles, and various items that when thrown into an opponent’s eyes would remove or hinder their sight. In today’s world it is easy to get your hands on a container of “tear gas” that you can carry in most states legally. They come in a variety of forms, from simple hand held containers to crowd and room clearing agents. But, let’s say you are traveling to Canada, or on a plane, you cannot legally carry an item such as this on your person, but what about that small container of cayenne pepper that you “love” to put on your food…J well of course it is legal, although strange to see someone carrying this but thrown into someone’s eyes it is as effective as most store bought tear gas. So my ninja’s in training that is just one method to take an ancient strategy and apply it in the modern world. This entry was posted in Uncategorized on April 4, 2013 by admin.